ನಾಲ್ಕೂವರೆ ತಿಂಗಳ ರಜೆ ಮುಗಿಸಿ ಕಳೆದ ನವೆಂಬರಿನಲ್ಲಿ ಮತ್ತೆ ಈ ಊರಿಗೆ ಬಂದಾಗ ನನಗೆದುರಾದವರಲ್ಲಿ ಹದಿಮೂರರ ಪೋರಿಯೂ ಒಬ್ಬಳು. ಆಕೆ ನನ್ನಲ್ಲಿ ಅಚ್ಚರಿ ಹುಟ್ಟಿಸಿದ್ದಳು. ನಮ್ಮ ಸಂಬಂಧಿಯೊಬ್ಬರ ಮಗಳು. ಸುಂದರಿ. ನಯ ಮಾತಿನ ನಾಜೂಕಿನ ಜಾಣೆ. ನನಗೂ ಅವಳನ್ನ ಕಂಡರೆ ಮುದ್ದು. ಅವಳಿಗೂ ನಾನೆಂದರೆ ಮೆಚ್ಚು. ಅಂದು ಭೇಟಿಯಾದಾಗ ಒಂದು ಕ್ಷಣ ಅಚ್ಚರಿಪಟ್ಟಿದ್ದೆ. ಮಾರುದ್ದ ಸೊಂಪಾಗಿ ಜೋತಾಡುತ್ತಿದ್ದ ಅವಳ ಜಡೆ ನಡುಬೆನ್ನಿಗೆ ನಿಂತಿತ್ತು. "ಏನಾಯ್ತೇ?" ಅಂದರೆ "ಡೊನೇಟ್ ಮಾಡಿದೆ ಜ್ಯೋತಿ ಆಂಟಿ" ಅಂದಳು. ಕೂದಲನ್ನೂ (ದೇವಸ್ಥಾನಕ್ಕೆ ಮುಡಿ ಕೊಡೋದರ ಹೊರತಾಗಿ) ಡೊನೇಟ್ ಮಾಡಬಹುದು ಅನ್ನುವುದರ ಕಲ್ಪನೆಯೂ ಇರದ ನನಗೆ ಇವಳಿಂದ ಹೊಸ ವಿಷಯ ತಿಳಿಯಿತು. 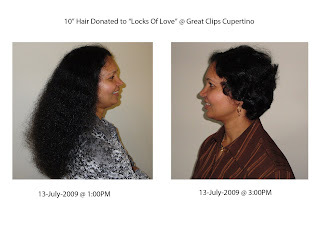 Locks of Love ಸಂಸ್ಥೆಯ ಬಗ್ಗ ಅರಿತುಕೊಂಡೆ. ಅದಕ್ಕೆ ಎರಡು ವಾರಗಳ ಹಿಂದೆಯಷ್ಟೇ, ಕುರುಚಲು ಕುರುಚಲಾಗಿದ್ದ ನನ್ನ ತಲೆಗೂದಲ ತುದಿಗಳನ್ನು ಟ್ರಿಮ್ ಮಾಡಿಸಿಕೊಂಡು ಬಂದಿದ್ದೆನಾದ್ದರಿಂದ ಆ ಸಂಸ್ಥೆಗೆ ಕೊಡಲು ಬೇಕಾದ ಹತ್ತು ಯಾ ಹನ್ನೆರಡು ಇಂಚುಗಳಷ್ಟು ಉದ್ದವಿರಲಿಲ್ಲ. ಕಾದು, ಕಾದು, ಕಾದು,... ಈಗ ಎರಡು ವಾರಗಳ ಹಿಂದೆ ಹತ್ತು ಇಂಚುಗಳ ನನ್ನ ಜುಟ್ಟನ್ನು ಗ್ರೇಟ್ ಕ್ಲಿಪ್ಸ್ ಸಲೂನಿನಲ್ಲಿ ಹೇರ್ ಡ್ರೆಸರ್ ಕೈಗೆ ಕೊಟ್ಟು, ಕತ್ತರಿಸಿಕೊಂಡು, "Donate to Locks of Love" ಅಂದು ಬಂದುಬಿಟ್ಟೆ. ಹಲವಾರು ವೈದ್ಯಕೀಯ ಕಾರಣಗಳಿಂದಾಗಿ ಶಾಶ್ವತವಾಗಿ ಕೂದಲು ಕಳೆದುಕೊಂಡ ಎಳೆಯರಿಗಾಗಿರುವ ಈ ಸಂಸ್ಥೆ ನಮ್ಮ ಕೂದಲನ್ನು ಬಳಸಿಕೊಂಡು ಅವರಿಗೆ ವಿಗ್ ತಯಾರಿಸಿ ಕೊಡುತ್ತದೆ. ಆ ಮಕ್ಕಳಿಗೆ ಸಿಗಬಹುದಾದ ನಗುವಿನಲ್ಲಿ ನಮ್ಮ ಒಂದೇ ಒಂದು ಎಳೆ ಸೇರಿದ್ದರೂ ಸಾಕಲ್ಲ! ಬೋಳು ಮುಖದ ನೋವನ್ನೂ ತುಂಬುತಲೆಯ ನಗುವನ್ನೂ ಹತ್ತಿರದಿಂದ ಕಂಡಿದ್ದೇನೆ. ನಮ್ಮ ಕೂದಲೇನು- ಬುಡದಿಂದ ಕಿತ್ತುಬಂದು, ನಡುವಿಂದ ತುಂಡಾಗಿ- ಉದುರಿ ಚರಂಡಿ ಸೇರುವಂಥದ್ದು. ಅದು ಕೆಲಕಾಲ ಒಂದಿಷ್ಟು ಗಿಡ್ಡವಾಗಿದ್ದರೇನು? ನನಗೆ ಸ್ಪೂರ್ತಿ ನೀಡಿದ ಮಗು ಈಗ ಮತ್ತೊಮ್ಮೆ ಹನ್ನೆರಡು ಇಂಚು ಕೊಡಲು ತಯಾರಾಗಿ ನಿಂತಿದ್ದಾಳೆ. ನೀವೂ ಸೇರಿಸುತ್ತೀರ ಅವಳ ಜಡೆಯ ಜೊತೆ ನಿಮ್ಮದನ್ನೂ? ನೀವೂ ಸೇರಿಸುತ್ತೀರ ಮತ್ಯಾರೋ ಮಗುವಿನ ನಗುವಿಗೆ ಎಳೆಗಳನ್ನು? My duties and responsibilities are tied to my identities. As a daughter, sister, cousin, niece, wife, daughter-in-law, sister-in-law, mother, and a friend are all part of my identities, while being a citizen, a student and a poet. Of these, which do I hold close to my heart, which means a lot to me, also becomes important when I list my scopes. Above all, what am I today, plays a major role. Being a citizen, a poet, a wife, a mother, a friend, and a student- are on top of the list of identities for me, as of this time and place in my life. Being a good citizen, irrespective of nationality, is the first thing. 1- Be responsible for my actions. 3- Respect my fellow citizens. 4- Help someone in need (will ask if help is needed, first). Being a poet, I have certain duties towards my readers, fans. 1- Respect every reader/ fan. 2- Be considerate towards readers’ sensitivity before countering their comments. 3- Have open mind and listen to fans. 4- Be responsible for my views. 5- NOT to put down one reader/fan for the sake of (in front of) another one. 1- Be supportive and encouraging in husband’s carrier decisions; and similarly to my son too. 2- Prepare meals and snacks. 3- Be a good friend to my husband and son. 4- Do the laundry and take out the garbage, do the housekeeping (not a top priority, anyway). 5- NOT to be judgmental. 1- Be supportive and encouraging at times; have fun and engaging as well. 2- Comment and criticize, depending on the context, in a constructive manner. 3- Listen to my friends’ heartaches and shortcomings, and not be judgmental. 5- NOT humiliate or insult my friends. 1- Respect my teachers and classmates. 2- Do my home works/ assignments. 3- Provide any help, if needed, to fellow students. 4- Attend the classes, regularly. 5- NOT be disruptive in any class-sessions. Date: Tuesday, 11th March, 2008. (Q) How long have you been a Paramedic, Fire-Fighter? What is your education background? I was an EMT (Emergency medical technician), prior to becoming a Paramedic. We need EMT certification, even before we apply for Paramedic school (Rules have changed now). So I attended San Mateo college, emergency technical foundation; worked for AMR (American Medical Response- Ambulance Service) for 1.5 yrs. Then went to paramedic school, Emergency Training Services at Santa Cruz, got my certification in Aug of 2000. Recently came to Mountain View, about 6 months now. Majority of my work was for AMR- Santa Clara County, before coming here. (Q) What type of Fire Station is this one? Station # 1, the head quarters has- 1 Engine, crew of 3 people; 1 Rescue, team of 2 people; and one Batallion chief. This is station # 2 and we are 3 people here, with 1 Engine. Other staions, generally have 1 Engine and 3 people crew. (Q) How many will go on Fire Truck, and how many in an Ambulance? Depending on the type of call, initially, one engine with Captain, one Fire-Fighter and one EMT will go. If it is Cardiac Arrest call, rescue team from Fire Station will come with 2 more crew members, one will be paramedic, to the scene. Usually 2 or 3 personnel will arrive, in an Ambulance. Other than full arrest cases, 3 people with the engine and 2 paramedics, is the norm. (Q) Is it good to be in one area/ locality as a Fire Fighter or Paramedic? As for paramedics, Ambulance service, AMR, works for Santa clara county-- from Gilroy to Palo Alto area, transporting patients to hospitals. Then, working in one specific area doesn’t really fit as much. As for Fire department, we are in 5 minutes’ response area, so that we arrive at scene under 5 minutes. Ambulance arrives later. It is good Fire department knows the area, knows the people who call a lot. It helps to Fire department having an intinmate relationsship with neighbors. (Q) How do you maintain your inner peace, your mental strength, in the middle of chaos? In the middle of chaos, if we get confused, we fall back to the ABCs, get back to the basics,and remember the training sessions. It happens. It is helpful to have a good team, who come with good skill sets. We utilise the skills of crew members and use the Paramedics who arrive on scene. (Q) How do you re-connect with your self, after some traumatic situation? Is there any coaching or guidence to meditaion, yoga, or some sort of inner-healing process for you? After a full arrest call, after some traumatic situations for infants and children, it is stressfull to us as well, it can be hard to be composed again quickly. We have certain programs to help us deal with that stress. We can go and talk about what we did, what could have been done, what went wrong, and how it could have been handled differently. We have EAP, if we need any help in dealing with emotional stress ourselves. CISP (Critical Incident Stress Debriefing) is very helpful. We get counseling or psychological type of help too, to cope with stress. Exercise and diet are big part, along with good sleep in dealing with stress. Some people walk, some meditate, and some exercise. Everyone has their own style of dealing with the stress. (Q) Do you take the help of bystanders, friends, family members at the scene? If there is a qualified physician in the scene, then there is provision that, the physician can assume control of the situation, if they want to. If they take that charge, they must ride in the ambulance to communicate with the emergency room doctors directly. And, if they agree to work, they have to work with the equipments that we have. Those may not be like the ones that they use in the hospitals. Also, they must realise our skills are less than theirs, and work around that. If it is full arrest case, or any other traumatic situation, the family members are allowed to stand by, only if they are not causing any problems. We allow them to watch how we help their loved ones, to reassure them that they are being taken care of. If the family members or friends cause problems, if they are being histeric, we keep them out, away. (Q) During your training, do you get instructions on/ knowledge about- nutrition, fitness, and weight training? Fitness is emphasisd in Fire Fighter training more than paramedic training. In Fire Academy, we get tested before and after the training program, that is 3 months duration. We are expected to have some improvements in our strength, and fitness in that time. In case of fire, we need to carry nearly 100 lbs, on us. And we need to get up and go even in the middle of night. If we are not physically fit, we won’t be able to cope with that. (Q) Is there any periodical assessment in the department, once you join the team? There are tests and annual assesments, of lab work, blood work. We also have Spirometry test- to monitor Air volume and flow rate in Lungs. Its Pulmonary function test. There are medical surveilence, for any harmful exposures on job, any toxic exposures. We are responsible to keep our fitness level. There is no personal trainer in any stations, or station gyms. We are on our own. Keeping fit is very personal choice. (Q) What if someone in the team slacks? How is that going to affect you all? Or does it? Yes, it does and it puts limitaions on the efficiency of the whole team. We go out as a team, if one person is not very fit, then we all return, change gas-tanks, or rest, or whatever it takes, and go back as a team again. So, if one person is not keeping fit by choice, it affects the efficiency of the whole team. Besides, each person’s efficiency and strength is different. Some may be good as paramedic, some may be good as Fire Fighter. So we all work for one cause, work with each other, and work as a team. (Q) What is the education qualification for an aspiring paramedic or fire-fighter? Fire department looks for commitment, undergrad or grads in any disciplene is welcome. Some knowledge on fire management is required. There are Plumbers, Electricians, Psychologists, and many different professionals who become fire-fighters. Department can use their extended knowledge. Over 18 years of age, no felony charges, no history of narcotic use, no history of any kind of misdemeaners, and such conduct requirements are there. There is a 3 months’ training in Fire Academy. San Jose, SFO, and Oakland fire departments are more liberal, since they recruit more (20 or 30) people at a time. Smaller stations, when they need only one or two people, are more specific in requirements. As for paramedics, after high school, they should get EMT certification and get into paramedic school. After the interview I thanked Officer Brian and drove back home, contemplating on the stressful situations they all go through everyday. why do we crib about stress in our life?